Realizing romantic heroes are a thing of the past, graduate student Eloise Kelly is determined to focus on her work. Her first stop: England, to finish her dissertation on the English spies of the Napoleonic Wars, like the Scarlet Pimpernel and the Purple Gentian. About Lauren Willig (Author) : Lauren Willig is a published author. 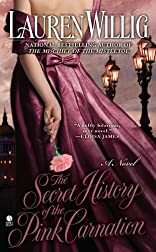 Some of the published credits of Lauren Willig include The Secret History of the Pink Carnation (Unabridged), The Secret History of the Pink Carnation.